Kinloch Plantation’s pecan oil is the perfect source for a healthy balanced oil low in saturated fat and high in anti-oxidants. It’s many favorable nutritional qualities challenge or exceed claims of more common oils such as canola, grapeseed and even olive oil. 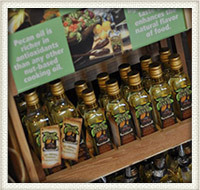 In addition, pecan oil’s neutral flavor profile gives it unmatched versatility in the kitchen. It will not mask or compete with the focus flavor of the dish or spices used and it’s very high smoke point expands it uses. 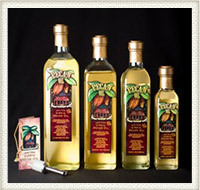 Kinloch Plantation Pecan Oil is an all natural product. No sodium, no cholesterol, no preservatives. Not hydrogenated, contains no solvents, no trans-fats or free fatty acids. Nothing but the healthiest of premium, gourmet oils that discriminating cooks will appreciate. Kinloch Plantation also offers it’s retailers a free, full program of retail merchandising support to ensure retail success. Attractive and effective product displays, six product sizes, consumer information handouts, recipe cards, product hangtags with tips and suggestions, and best of all, a product your customers will return for. 100 ml/3.4 oz 24 ct.
250 ml/8.45 oz 12 ct.
500 ml/16.9 oz 12 ct.
750 ml/25.35 oz 12 ct.
1 liter/33.75 oz 9 ct.
1 gallon/3.75 liters 4 ct.
Free Freight on any order, every time!